This is not efficient. Curio is efficient. I open a file in Curio called “Nita’s Plot” or “Nita’s Curio” or whatever. I hit that plus sign at the top to add a new board choosing from all kinds of backgrounds (I tend to stick with plain white or a grid). I can do multiple copies of a board–say I want to do a map of an act first from one PoV and then rewrite it for others–and I can drag and drop them to stack them so they’re organized (click on the little triangle to the left of the board name to show all the boards underneath it). I can drop in images or videos (I never use videos, but Curio supports them), use any font on my computer, access any color I want for bubbles and type, make images transparent so I can overlay them . . . basically do anything except edit images (for that I have Acorn). And if I change my mind about where a scene goes or how I want to code it, I just drag and drop to get what I want. 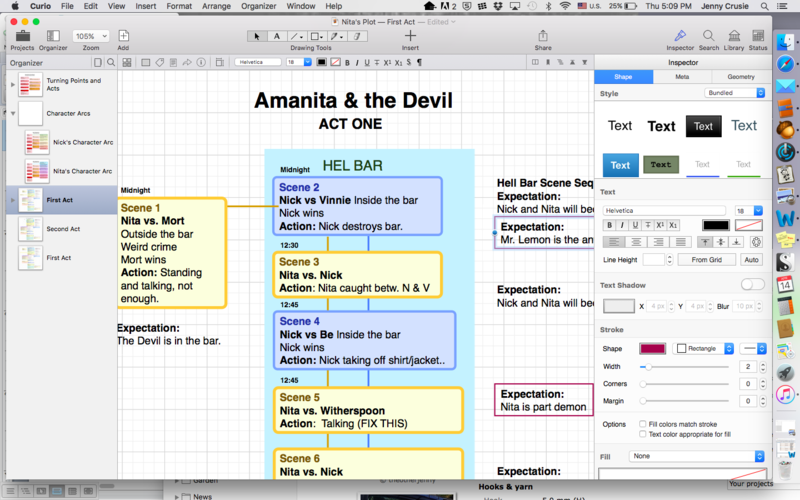 • I start with one box for each scene, color-coded for the PoV characters–yellow for Nita, blue for Nick–so I can see at a glance if I have my PoVs fairly evenly distributed and if most of them belong to Nita, my protagonist. • The boxes for Nita’s solo scenes are on the left, Nick’s solo scenes on the right, the ones they share are down the middle so I can make sure I’m not keeping them apart too much. • The notes in each box are for protagonist vs.antagonist and who wins because if I can’t fill that in, I have no conflict. • The boxes behind the character boxes are color coded for setting, yellow for the diner, green for the nature reserve, aqua for Hel Bar, and so on. • The symbols in the boxes and their relative sizes show the arcs of some of the plot lines: stars for Nita coming to accept the supernatural, hearts for the romance plot (still very small because this is the first act), spirals for reversals. The idea is that I can look at this graphic and see the shape of the first act, complete with symbols that show the escalation of the different plot points. 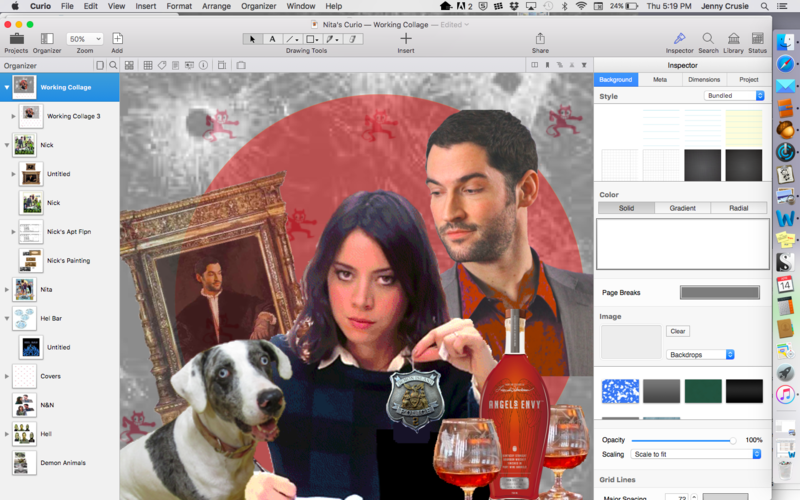 I also do all my digital collages in Curio, but we’ve already talked about that. Basically, it’s second only to Word in importance in writing my novels. One caveat: I only do this when the majority of the scenes have been written in rough draft form; in this case I have 22 scenes written out of the 27 in Act One. Otherwise, the outline starts driving the story which is very bad. But once I have a rough draft, this kind of map is hugely helpful. You can see why I prefer Curio. And now back to actually writing the book . . . This is fascinating – thank you! I actually have Curio (because you recommended it) but I haven’t quite got to grips with it (mainly because I’m ridiculously impatient). This post has reminded me to go back and persevere! I really like knowing that you don’t do all this until you have most of an act written. I try to be a plotter but I am actually a pantser; at least for the first draft. I tried to do otherwise and I definitely felt like the outline was driving the book instead of me. I personally love the sketchbook idea. I’ve done Pinterest boards but the drawback is it’s hard to look at them as I write. I wish I had talent in the visual arts. 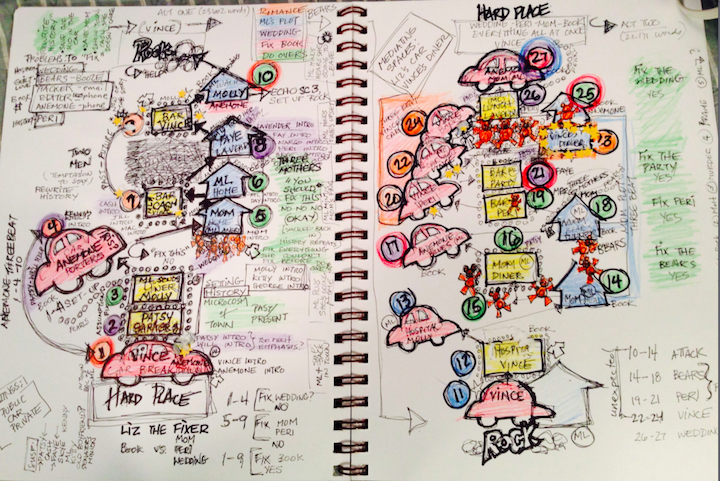 Your curio document looks like a cool infographic, and the sketch book is even cooler. One of the interesting things about this book (to me the rest of you are probably bored silly) is that I got the idea for it here, bitching about the waste of Tom Ellis and Rachael Harris on Lucifer in this post on January 27. So eleven weeks ago. Then later the same day, I did a post on how I’d change the story and it snowballed from there. I just kept following my nose. I went to bed last night feeling a little guilty because I had a couple of scenes to write in the first act yet, and I knew what they were going to be but I was tired and when I opened a file to start typing, it just wants there in my head. Woke up this morning with everything in there. The key is to trust the Girls and give myself space. And write like the wind, as Bob used to say when I’d fall behind. No, I don’t have the story beats. I just write to find out. At some point, it begins to look like a book, and then I have to know protagonist (always my heroine) and antagonist and what her goal is and what the climax will be. Once I have that endpoint, I have a direction to head in. The reason I need to do this diagram now is that the first act is the set-up (and I’m already over 33,000 words on it while missing five or six scenes. That’s okay, I’ll cut like crazy before it’s finished, but I need to step back and look at that first third of the book as a unit in itself, to see what it was missing, how the characters arced, how the relationship arced, just the shape of the thing. When I printed the map out, the first print out puts the whole thing on one page so it’s tiny, which is excellent because I can see the shape of it without reading it. And I realized that this act broke itself into four acts, and once I looked at them that way, a lot of things shifted and made sense. Which is probably another blog post. Wait, wait, wait. I remember that post. I read that post right around when you put it up (minus a week or two). IT’S BEEN ELEVEN WEEKS?! What? How? When? GAH. What a useful program. I could sure use it as I try to plan the structure and content of my company’s four web sites. I think it’s a Mac only program, though… makes me wonder if there is a good Windows alternative w/ similar features. I also use Evernote, and might explore if Mohiomap would work within Evernote and be similar to Curio. I only know Mac, so I’m no help there. Google maybe? This is excellent, thanks Jenny. Followed by Neil Gaiman’s defense and GRRM breaking Paul and Storm’s guitar. I don’t use any computer programs, but I lean heavily on paper scribbles. I keep a clipboard beside me at all times. It holds everything to do with the book, from timeline to character details, and the top page starts out blank. It often fills up by days end. Rob what you do sure works for you and as one of your readers I love what you do. Simple but valid anti-ArrowFlashback post. Fascinating. Also so glad to hear how much fun you’re having not writing this book. If I still lived in the huge house, I’d do that in a nanosecond. Do you still use Scrivener? I love Scrivener. And Scapple. I don’t use Scrivener. I’ve found that Curio and Word work better for me. I think it’s a terrific program, it’s just not the way I work. Oh, Love Lucifer! His struggle is so fun to watch. HATE how they do Chloe’s eye makeup. I’m hoping there’s a reason for it, but mostly it just aggravates the hell out of me. Grrr. Chloe annoys me. Actually the whole show annoys me, although I really like the actors.